Dimensions: 6 x .9 x 9 in. Joe Wilson served for twenty-eight years as executive director of the National Folk Festival and National Council for Traditional Arts. Throughout his impressive career, Wilson wrote extensively and colorfully about many facets of vernacular music in North America, including works on major folk instruments, as well as on characteristic musical styles, especially old-time, bluegrass, modern country, blues, cowboy, a cappella gospel, and others. 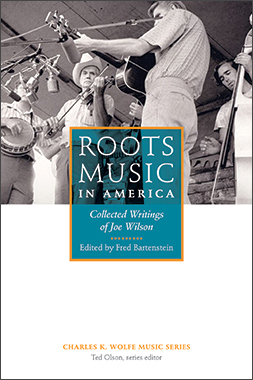 This volume, a companion to Lucky Joe’s Namesake: The Extraordinary Life and Observations of Joe Wilson, compiles Wilson’s best writings on musical topics, including some previously unpublished works. With wry humor, Wilson covers the origins of roots music in eighteenth-century America and its subsequent dispersion through races, classes, ethnic groups, and newly settled regions. Wilson knew, worked with, and wrote about many iconic artists of the twentieth century, including Willie Nelson, Doc Watson, Clarence Ashley, the Stanley Brothers, Kenny Baker, Cephas & Wiggins, John Jackson, and members of the Hill Billies – the band whose name came to signify an entire genre of the earliest recorded roots music. This carefully curated volume is comprised of works previously scattered in liner notes, small-circulation magazines, tour booklets, and unpublished manuscripts, all collected here and organized by theme. The writings of this legendary, internationally recognized figure will be indispensable to roots music fans and will delight readers and students interested in the traditional arts and dedicated to preserving historic folkways. Fred Bartenstein teaches country and bluegrass music history at the University of Dayton. He is the editor of Bluegrass Bluesman: Josh Graves, a Memoir and coauthor and editor of The Bluegrass Hall of Fame: Inductee Biographies, 1991–2014.